i switched the shirt and shorts, but kept the jacket. i have been craving mostly all white lately, even though this outfit is completely dark. the blazer is actually navy, not sure how well that translates. the boiling temperatures will be gone soon, so i am taking advantage and wearing shorts as much as possible. 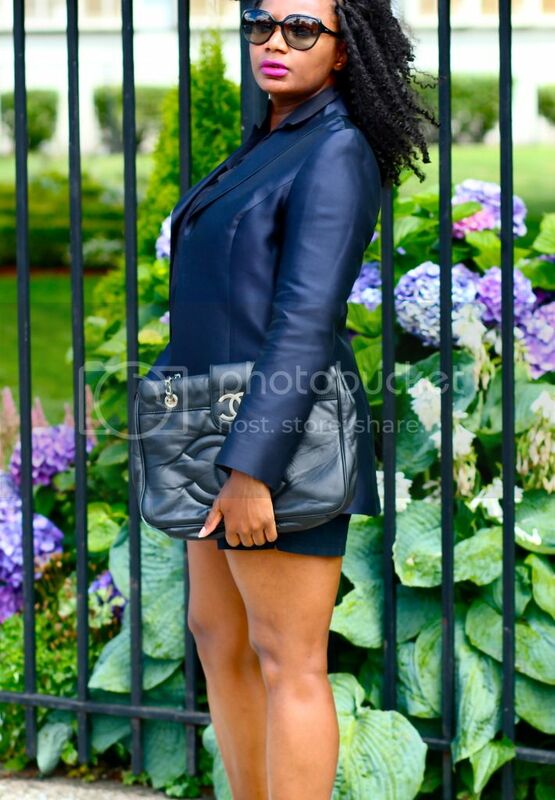 i am wearing a reconstructed blazer, thifted shirt and shorts and the booties are from a shoe store in brooklyn. happy weekend, babes! you look great!! !and you have a lovely hair!! You're looking great in these dark colors! ;)) Dangerous/mysterious/business lady :D I love the look! You look FAB! Love this outfit a lot. That Chanel bag is hot!! Lovely look! Like the edgy shoe paired with this ensemble. My name is Mia and I really like your blog. I hope we could follow each other. The shorter the better :). You got a great blog girl! Love your posts and outfits. Maybe you like to follow each other? Let me know on our blog We follow you now, and We will be back for sure!! I love your outfit! Everything you wear is gorgoeus and especially your shorts and your blazer!! What a perfect match!! Your curly hairs are stunning! super stylish and full of attitude! love those heels!